BARCELONA—Cord cutters have no shortage of ways to get their favorite shows on their TV, from Netflix and Hulu on a smart TV or set-top box, to antenna-connected DVRs like the Channel Master DVR+ that wowed us at CES. 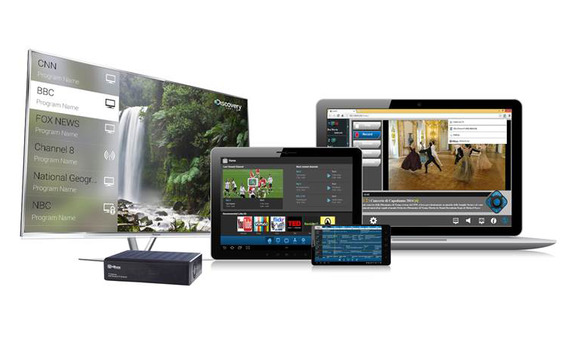 VBox’s is very similar—it’s a whole-home DVR that connects to your network and lets you watch and record live TV on multiple devices at once. V@Home is all about flexibility—record any source and watch on any device. You can connect an antenna for over-the-air HD programming, and there’s even a cable card slot if you want to use it with a cable or satellite subscription. Then just connect it to your home network, and attach your own hard drive for storing the recordings. You can control the V@Home with the slick Android and iOS app, or use whatever media app you already use, such as VLC or XBMC—the box shows up as a UPnP device on your network. But the official app’s experience is solid, with easy-to-understand navigation. Any of your devices (computer, tablet, and phone) can act as the display or even the remote, since the app allows you to start playback on one device and then send it over to another. The app also has a programming guide and lets you schedule recordings with just a couple of taps. Two- and four-tuner models mean you can officially watch up to four different channels at once, on four devices. But VBox’s VP of marketing Amir Aharonovich explained to us that broadcasters can actually include up to six SD or two HD channels per stream, so if that’s the case in your area, you could potentially stream up to 24 channels at once. OTT support is built in to the Vbox app too—our demo at MWC included a spin with ITV (think Hulu for the U.K.) for on-demand shows without leaving the VBox app. V@Home launched Sunday at Mobile World Congress, with immediate availability in Europe; VBox has plans to bring it to the United States in the second half of this year.